The night before the official start of the Consumer Electronics Show in Las Vegas, a number of companies gather together for an event at the Bellagio (the hotel with the cool fountains that fire off in time to music). It’s a relatively small affair—dubbed the Digital Experience—reserved for members of the press to get a look at many of the products that will be on display for the 130,000 or so people walking the multiple show floors during the four-day event. (If you’ve never been, CES makes Macworld Expo look like a quaint little Cub Scout meeting ). Although my colleague Christopher Breen kept his eyes open for everything iPod-related at the event, I tried to find some other interesting products. 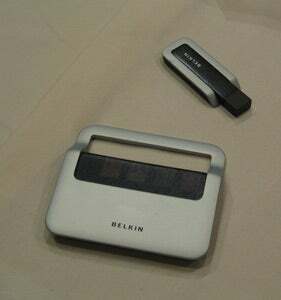 Belkin, for example, was showing off a prototype of its CableFree USB Hub (pictured below to the right), the industry’s first USB hub that doesn’t require a cable to your computer. How does it work? Belkin says it’s the first product to be introduced into the US that takes advantage of Ultra-Wideband (UWB) technology, which is up to 100 times faster than Bluetooth (often referred to as “wireless USB”). The four-port hub will allow you to connect printers, scanners, hard drives, and more to a nearby computer. The product, which should be available this spring, will cost around $130 to $150. Netgear also had its new RangeMax 240 Wireless Router on display. The router offers a maximum of 240Mbps, nearly four-and-a-half times that of standard AirPort Extreme (802.11g) networking, and high enough for streaming of HD video. Although the only adapters available currently are PC Slot cards, Netgear plans to introduce a USB 2.0 module to add compatibility to Macs and desktop PCs. A company PR person did say, however, that even using the router with current 802.11g cards would nearly double the bandwidth to 100MBps, roughly the same as standard Ethernet. The router is available now for around $140.